The Resort features deluxe accommodations that range from 249 luxurious guest rooms and suites to private one-, two- and three-bedroom villas with spectacular lake views. The resort is also home to Air Horseshoe, a private charter jet service, with an Airport and Jet Center complete with a 6,000-foot runway, terminal, and hangar. Horseshoe Bay Resort offers a range of beautifully appointed accommodations; from 249 guest rooms and suites in the main hotel building to private villas which can accommodate families, larger groups, and guests planning longer stays. 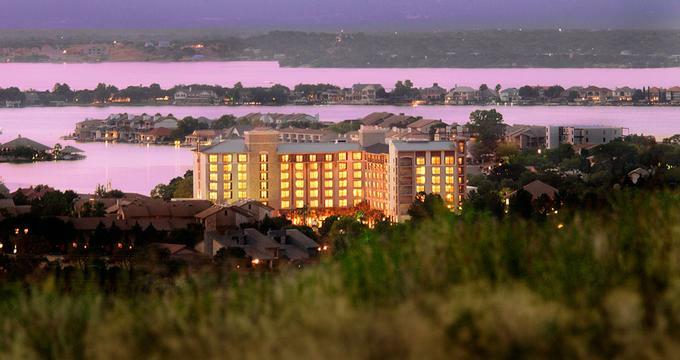 All accommodations feature modern amenities throughout, including elegant décor, comfortable beds with plush bedding, flat-screen televisions, complimentary high-speed internet access and floor-to-ceiling windows with stunning views of the lake and the surrounding Texas Hill Country. All guests have access to the hotel facilities such as restaurants, lounges, the spa and fitness center, meeting rooms and other venues, as well as concierge services. Classic Guest Rooms are spacious and bright with one king bed or two double beds, luxury bedding, and a desk table for working. A tiled en suite bathroom offers a shower, a vanity with marble counter tops, a make-up mirror, and deluxe bath products, while general room amenities include a flat-screen television, clock radio with CD player, mini refrigerator, complimentary in-room coffee and tea, and cordless direct-dial telephone with two phone lines and voice messaging services. Floor-to-ceiling windows offer partial swimming pool or Texas Hill Country views. Premium Rooms are the same size as Classic Rooms at 325 feet, and offer the exact same features and amenities, such as king bed or double beds with luxury bedding and tiled en-suite bathrooms with showers, makeup mirrors and an assortment of toiletries. Spacious living areas include a flat-screen television, clock radio with CD player, mini refrigerator, complimentary in-room coffee and tea, and cordless direct-dial telephone with two phone lines and voice messaging services.. Premium Rooms also have floor-to-ceiling windows offering full views of the swimming pool, the glorious hill country and lake. Premium Balcony View Rooms are slightly larger than the Classic and Premium Rooms and share all the same facilities and amenities, but have the added luxury of a private balcony with beautiful views over the swimming pool and Lake beyond. Individual climate control keeps rooms cool in the summer and warm in the winter, and comfortable king-size beds are dressed in plush linens. he James Bowie Suite is ideal for entertaining guests with additional living space, an entertainment area with wet bar, refrigerator, and service pantry. The Suite offers a separate king bedroom with luxurious bedding, individualized climate control, and an en suite bathroom and dressing area with marble countertops, single vanity, make-up mirror and deluxe bath products. The sunny living area features modern amenities, including a work desk and ergonomic chair, cordless direct-dial telephone with two phone lines and voicemail, flat screen television, and complimentary high-speed internet access. Floor-to-ceiling windows and a private balcony boast beautiful views of LBJ Lake and the resort swimming pool. The Sam Houston Suite offers the same facilities and amenities as the James Bowie Suite with a king sized bedroom, private balcony, and deluxe amenities while the William B. Travis Suite also has ample space for entertaining with an entertainment area with wet bar, refrigerator and service pantry. The Presidential Suite takes luxury to new heights with 1,200 square feet of space, separate living, dining and sleeping areas, and superior amenities. A stylish entertainment area features a gas fireplace, wet bar, full-sized refrigerator, service pantry with a dining area which is perfect for dinner parties with friends. A roomy bedroom offers a huge king-size bed with imported linens, and an en suite bathroom has a jet bathtub, vanity, make-up mirror and deluxe bath products. There are flat screen televisions in both the bedroom and living room, as well as individualized climate control, complimentary in-room coffee and tea, a work desk/table and chair, and complimentary high-speed Internet access. A large private balcony is perfect for enjoying morning coffee with panoramic views ofthe Lake. Paseo Vacation Apartments, located next to the hotel tower, offers families, groups of friends or guests planning longer stays an option of one-, two-, and three-bedroom vacation apartments to rent. One-Bedroom Paseo Vacation Apartments feature semi-equipped kitchenettes with microwaves, mini refrigerators and coffee makers, a master bedroom with queen-size bed and a queen sofa bed for extra guests and tiled marble en suite bathrooms with showers. Other one bedroom apartment amenities include individual climate control, desk table and chair, cordless direct-dial telephone with two phone lines and voicemail, iron and ironing board, and complimentary high-speed internet access. These apartments offer views of the resort tennis courts, Paseo Pool or the area neighborhood from private balconies or patios. Two-Bedroom Paseo Vacation Apartments cover approximately 1,354 square feet and offer the same facilities, features, and amenities as the One-Bedroom apartments, with the addition of a well-equipped kitchen with housewares for up to four guests. Two bedrooms have private en suite bathrooms with baths and showers and a queen sofa bed which can be used for extra guests. Three-Bedroom Paseo Vacation Apartments are 1,746 square feet and offer the same facilities, features, and amenities of the Two-Bedroom apartments, but with a kitchen well-equipped with housewares for up to six people. Three bedrooms have private en suite bathrooms with baths and showers and a queen sofa bed can be used for extra guests. The Waters offers discerning guests an extra level of privacy, comfort and style. One-, two- and three-bedroom villas feature designer décor and furnishings and cutting-edge technology. Fully equipped gourmet kitchens with granite countertops feature top-of-the-line appliances, cookware, dishes, and flatware. Living spaces boast state-of-the-art electronics, including two large high definition flat screen televisions and iPod docking stations. Each unit, has a washer/dryer unit. Spacious furnished balconies offer spectacular views and complimentary high-speed internet access is available throughout. Horseshoe Bay Resort offers a range of elegant and casual lakeside dining both in and around the resort tower against a backdrop of beautiful lake and hill country views. The Yacht Club Dining Room,the main restaurant at Horseshoe Bay Resort, offers sophisticated lakeside dining lakeside year-round. Décor in a classic nautical theme is reminiscent of the Hamptons, with elegant table settings and inviting nooks for post-dinner drinks. An elevated patio is perfect for alfresco dining under the stars and a seasonal menu features fresh seafood, succulent steaks and a variety of chef’s specialty dishes. Lantana Restaurant and Bar is located in the hotel tower and serves casual cuisine for breakfast, lunch and dinner with a Southwestern flair. Diners can enjoy a tropical experience on the outdoor patio amongst the palms or in the comfortable dining room, which boasts a vibrant ambiance in the evenings. The Lantana Bar is the perfect place to enjoy a drink and catch the game with a good selection of cordials and more than 200 wines from around the world. Guests can enjoy live music and other entertainment on Saturday nights. The Slick Rock Bar & Grill is a casual restaurant based on the scenic 12th fairway of the Slick Rock Golf Course. The eatery, known for its legendary Slick Rock Burger and fries, serves breakfast and lunch in a casual comfortable golf clubhouse setting. The Cap Rock Cabana serves the Apple Rock and Ram Rock Golf Courses and offers a variety of on-the-go drinks, sandwiches, and snacks for golfers. Café Del Sol is a favorite poolside bar which serves a delicious array of appetizers, sandwiches, and light snacks, along with cocktails, beers, spirits and wine. Located in the Resort Tower, the Market serves ready-to-go drinks and snacks, such as freshly brewed Starbucks coffee. The Bayside Spa is a full-service spa and salon and presents guests with the opportunity to unwind and be pampered in style. Spa services include a variety of body, face and skin treatments and therapies such as massages, holistic therapies, skin care, facials, manicures, pedicures and signature spa packages. The spa’s luxurious facilities include eucalyptus-infused steam rooms, a dry sauna, a whirlpool and a private lounge. Horseshoe Bay Resort features four exquisite swimming pools. Stargazer and Turtle Beach are two lovely beaches located at the Horseshoe Bay Resort Yacht Club which offer a variety of water sports and beautiful lakeside views. Turtle Beach is a child-friendly beach with a safe swimming area while Stargazer Beach is an adults-only beach that is perfect for swimming, star-gazing and romantic weddings. The Yacht Club swimming pool is the resort’s signature pool and is surrounded by cabanas and the 27-person Yacht Club hot tub, renowned as being the largest hot tub in Texas. Hotel Tower Pool is a heated pool with fiber-optic lights, a hot tub, and kids’ pool while the Paseo Pool, situated inside the Paseo Vacation Apartments, offers a peaceful escape. The adults-only Cap Rock Pool overlooks the magnificent Apple Rock Golf Course’s 18th hole, and features a 30-foot cascading waterfall and multiple tiers of rock. The Cap Rock Pool is available for members only. Horseshoe Bay Resort is home to the Bayside Fitness Center, a modern and fully-equipped fitness center and gym that features state-of-the-art cardio and weight training equipment. The center also offers free-standing weight machines, stationary and elliptical bikes, and a range of classes such as Zumba, Yoga, Pilates, Sculpt and Strengthen, Body Pump, Aqua Fitness and more. The Resort’s Activity Center presents a wealth of recreational adventures and activities for every taste from whitewater rafting, football, cycling and lawn games to ping-pong, arcade games, arts and crafts and picnicking. Horseshoe Bay Resort features an array of venues for a variety of functions, ranging from weddings and receptions to business conferences, meetings, and corporate events. Horseshoe Bay Resort offers both indoor and outdoor venues with lakeside, waterfront, Hill Country or golf course views, and can provide a function room, banquet hall or ballroom ideal for every occasion. Professional event and wedding planners, meeting gurus and conference organizers are on hand to take care of every need, from accommodation, catering, transportation, and venue to smaller details such as seating, audio equipment, music, DJs and wedding cakes. he Horseshoe Bay Resort Airport and Jet Center offers aviation services to resort guests. The Center features a lighted 6,000-foot runway and can accommodate all personal and business aircraft up to a regional jetliner. Other facilities include aircraft parking, hangar spaces and fuel services. Additionally a professional Resort Jet Center Team is on hand to offer services such as transportation, flight planning, aircraft charter, maintenance, management, and sales. Back to: Romantic Weekend Getaways in Texas and Romantic Weekend Getaways from Austin.